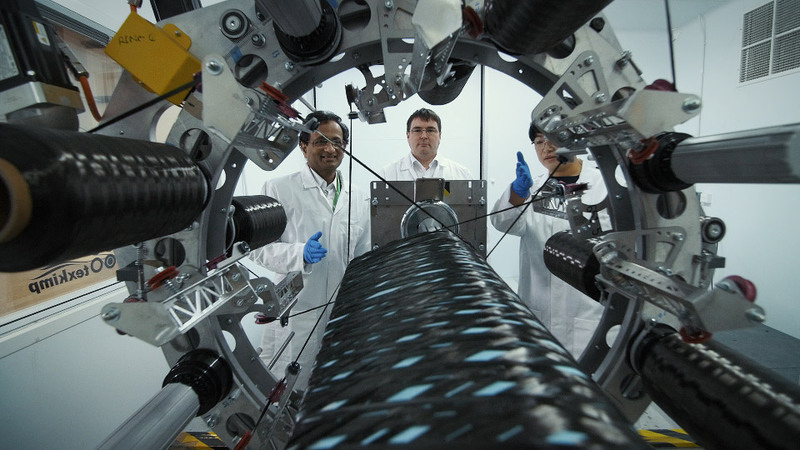 A cutting edge machine that winds carbon fibre into lightweight parts for automotive and aerospace has been developed by advanced engineering company Cygnet Texkimp and The University of Manchester. The 3D Winder is the world’s first robotic 3D winding machine capable of making complex parts such as fuel pipes, cant rails and aeroplane wing spars. It can also be adapted to produce components for other markets including wind blades for the energy sector. The machine is based on the 9-Axis robotic winding concept first developed by the University’s Professor Prasad Potluri and uses a technique known as filament winding. It works by laying down carbon fibres much more quickly than traditional methods such as braiding and weaving, with trials showing it has the potential to wind an aircraft spar in just a few minutes. As part of the KTP, the technology was further developed at Cygnet Texkimp’s R&D centre where the internationally-renowned fibre processing specialist designs and builds machines that convert raw fibres including carbon fibre into useful advanced materials and end products for the worldwide automotive, aerospace, wind energy, oil and gas and sporting goods sectors. “The 3D Winder revolutionises what the composites industry can achieve with winding. It offers compelling benefits to high-volume manufacturers in terms of cost and speed of manufacture, as well as the strength, uniformity and repeatability of the finished product. “We’re standing on the threshold of a new generation of lightweight, fuel-efficient motorcars and aeroplanes, where demand for greater fuel efficiency and lower emissions is driving the need for better ways of producing and using intelligent materials such as carbon fibre composites. Our long-term objective is to see this technology adopted as a conventional way to produce composite parts throughout the world.